A contract to the tune of US$218,050 was inked yesterday to facilitate the preparation of final designs and provision of construction supervision services for the expansion and refurbishment of three Technical, Vocational, Education and Training (TVET) facilities at the secondary level. These facilities are located at Fellowship (Region Three), Beterverwagting (Region Four), and Hopetown (Region Five). 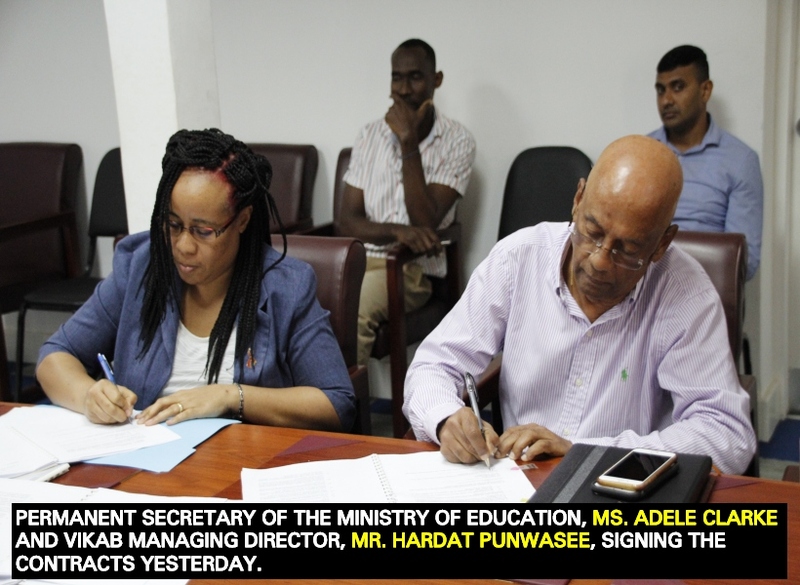 Inking the contract were officials of the Ministry of Education and Vikab Engineering Consultants Limited in association with Vikab (Guyana) Limited, and JAIN Consultants of Trinidad and Tobago Limited. This undertaking is Lot ‘B’ of the Enhance Learning Component of the Guyana Skills Development and Employability Project (GSDEP). According to Project Coordinator of GSDEP, Mr. Terrence Siebs, the project has been long in the making and it is now at the stage where there is an experienced design engineering consultancy firm on board. He said that the GSDEP is a project funded by the Caribbean Development Bank through a loan and a grant agreement and funding from the Government of Guyana. According to Siebs, there is another component of the project which entails the training of teachers which will make the education system better.